Jonas Runberger is an architect active in practice, research and education, currently based in Stockholm. 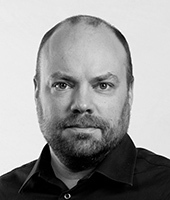 He is the director of Dsearch – a digital design development network at White arkitekter, and an Artistic Professor in Digital Design at Chalmers School of Architecture and Civil Engineering. He has taught, lectured and been published in Sweden and abroad. His main interests involve the relation between design techniques, architectural production and experiential effect, with an emphasis on the impact of digital technology on both experimental and conventional practice. Particular concerns within this field are means for collaborative design processes, digital technology as support from early design stages to final production, and the relation between research and practice. He holds a licentiate and PhD from KTH School of Architecture, and has previously taught at KTH, the Architectural Association School of Architecture, the London Metropolitan University and the ETH.